Bavaro caught 55 passes for 771 yards and four touchdowns in college and received All-American honors from the Associated Press in 1984. He was chosen by the Giants in the fourth round of the 1985 NFL draft. 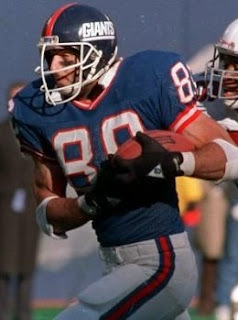 With TE Zeke Mowatt lost for the entire year due to a knee injury, Bavaro moved directly into the starting lineup and performed well, catching 37 passes for 511 yards (13.8 avg.) and four TDs. Giants went 14-2 to finish first in the NFC East with the conference’s best record. Won NFC Divisional playoff over San Francisco 49ers (49-3), NFC Championship over Washington Redskins (17-0) & Super Bowl over Denver Broncos (39-20). A tough, physical all-around tight end with good hands, Bavaro followed up with 55 catches for 867 yards (15.8 avg.) and eight touchdowns in 1987 and was again a consensus first-team All-NFL and Pro Bowl selection. A holdout and injuries led to a lesser season in ’88 although he still pulled in 53 passes. Bavaro was limited to seven games in 1989 by a knee injury and, following a lesser year in ’90 playing with a degenerative knee condition, it appeared that his career might be over as he missed the entire 1991 season. However, he caught on with the Cleveland Browns in ’92, caught 25 passes, and moved on to the Philadelphia Eagles for his last two seasons in 1993 and ’94, catching 43 passes with six TDs in ’93. Overall, Bavaro caught 351 passes for 4733 yards (13.5 avg.) and 39 touchdowns, with 266 of those catches for 3722 yards and 28 TDs coming with the Giants. He was twice a consensus first-team All-NFL choice and was also named to two Pro Bowls. His brother David played linebacker for five seasons in the NFL with four different teams.